My 9 year old granddaughter Grayson still railfans with her grandpa and grandma. We had her for a week in August 2014 and took a trip through Illinois, Wisconsin, Michigan, and Ohio. 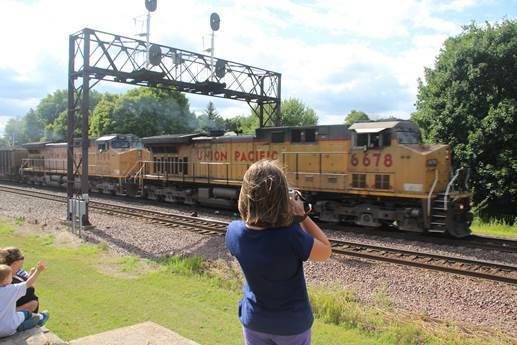 The trip was a mixture of railfanning and visiting various historical sites. 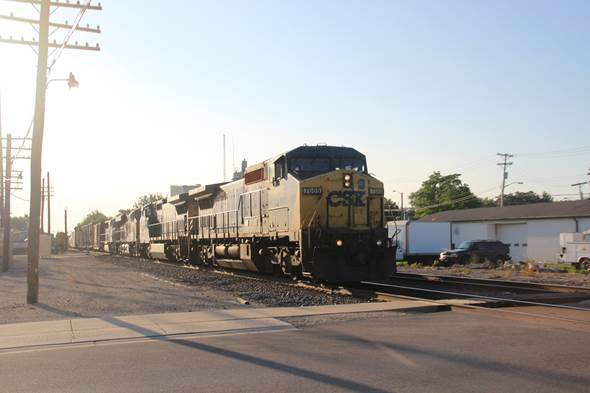 The first railfan site we hit was Rochelle, Illinois. We spent an afternoon and a morning here before Mary Ann said enough fun, and we need to move on if we were going to visit the Illinois Railroad Museum. During our stay at Rochelle Grayson and I shoot photos of some 33 trains. I will admit that most of the photos Grayson took were trash, but she did generate a few decent pictures which I have included below. Grayson was using my old Canon Rebel XT as for Christmas I had gotten a Canon Rebel T3i. The three of us had a great time interacting with the various railfans that had gathered at the Rail Park for the two days we were in Rochelle. We meet people from California, New Jersey, and a verity of states in between. There was also a gentleman from Wales, not England or Scotland, but Wales as he insisted. He was making a pilgrimage through the Northeast photographing trains. A number of railfans had laptops with them that had pulled up on them a display of the current track circuitry so we knew well in advance from where a train was coming. Those who have been to Rochelle will note that while many of the pictures were taken from the viewing platform we did not stay there all the time, but did move around the area for different picture angles. 1. 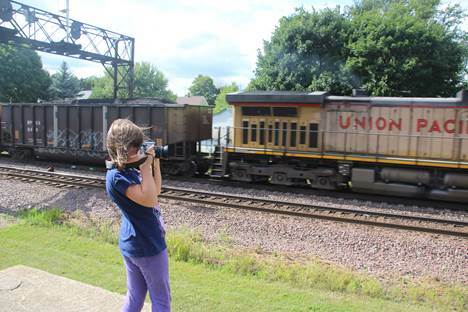 Within 5 minutes of arriving at the Rochelle Railfan Park Grayson was taking her first photos, just like the other railfans. 2. Notice the follow through, Grayson gets the train coming and going. “Grandpa this is fun but the locomotive are all UP not CSX.” I had to break her heart and tell her CSX did not run by here just UP and BN-SF. 4. Grayson’s first photo shows the engineer of UP 6678 waving at her. 5. UP 8427 and UP 6337 roll pass westbound with a solid train of covered hoppers. 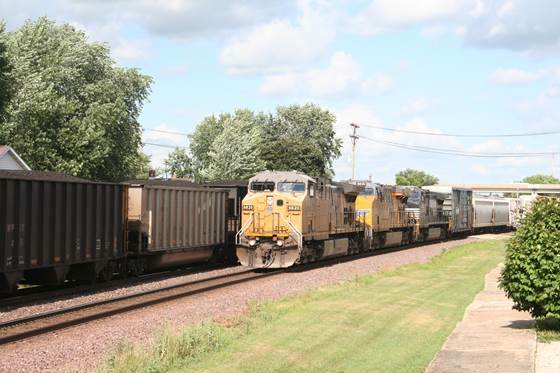 We would see a number of unit trains of covered hoppers moving grain or heading out to pick up grain. 6. This east bound train headed by UP 6820, UP 8018, and NS 9374, pulling a mixed freight, is being run pass an eastbound unit coal train. 7. 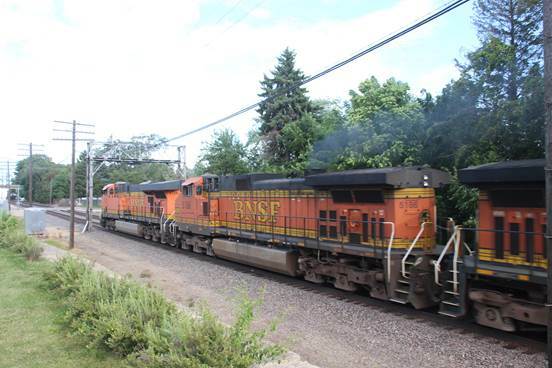 BN-SF 5436 and 6433 are seen westbound with a stack train. At supper time when we left to eat I drove to the street located across the track from the viewing platform, and here, under the watchful eyes of Mary Ann, we took some photos of one last train from ground level. 8. 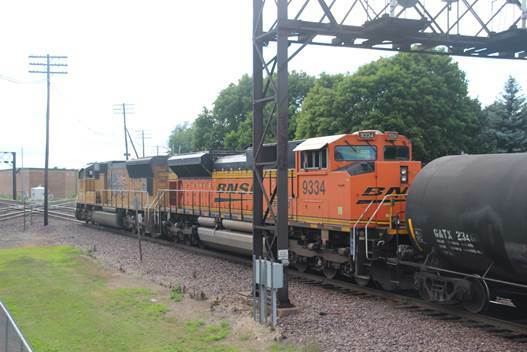 UP 4919 and BN-SF 9334 are west bound with a unit tank train. 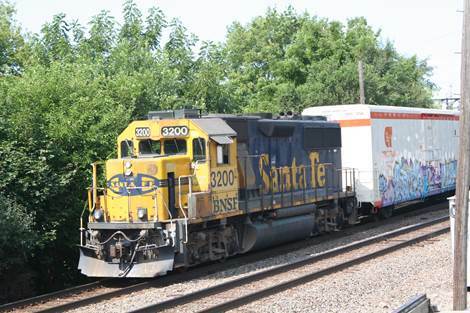 I was told that they were pulling an oil train from North Dakota, but there was no spacer car between the locomotive and the tank cars so I am not sure what was in the tank cars. 9. Grayson at first thought that we had a steam locomotive coming at us, but it was only BN-SF 5186 smoking heavily. 10. Much to Grayson’s joy as we started to turn into the Railfan Park on the morning we were leaving town I heard a train blowing for the crossing. Quickly parking alongside the street we got out with our cameras ready. 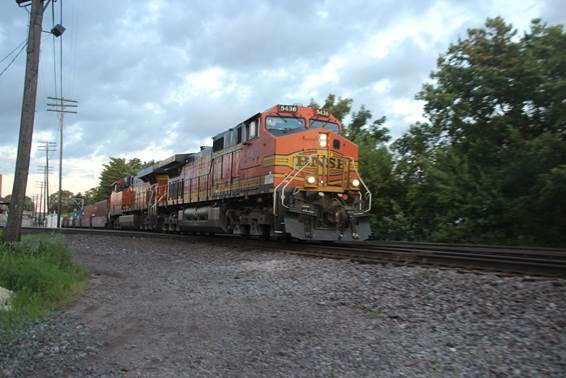 Grayson captured a photo of the one and only CSXT powered train we saw at Rochelle. 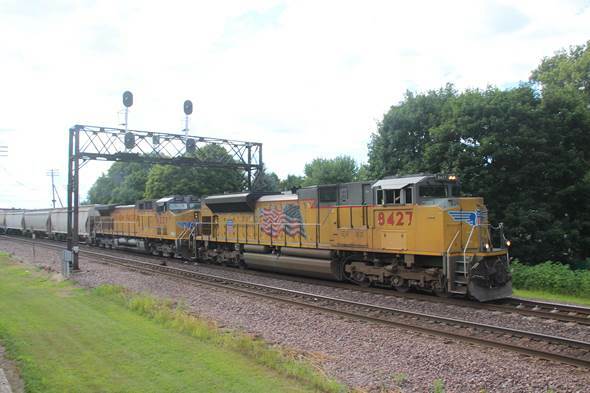 Leading the train were CSXT 7869 and CSXT 748 followed by BN-SF 7438 and 9774. 11. 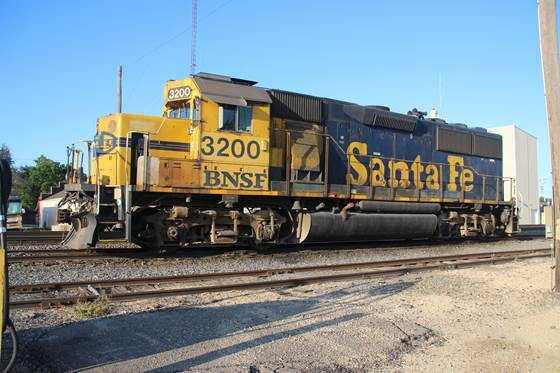 BN-SF 3200, still in Santa Fe colors, is seen returning to the Rochelle Yard after switching some local industries. 12. As we left town we stopped at the BN-SF Rochelle Yard and caught BN-SF 3200, the local switcher, chugging away waiting for her crew to return to continue that days switching. 13. As I stated at the beginning of the article some of the railfans had their lap tops with them. 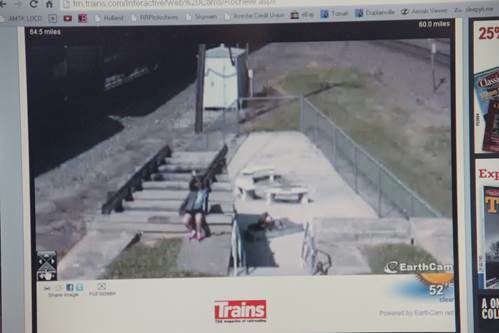 When Grayson called home and had her parents go to the Trains’ web page so she could wave at them, one of the railfans brought up the page on his computer so I could take a photo of Grayson on Trains’ Rochelle web cam. Train images used by permission of Charles H Bogart.